Researchers at Tokyo Institute of Technology have designed a CO2 reduction method based only on commonly occurring elements. Achieving a 57 percent overall quantum yield of CO2 reduction products, it is the highest performing system of its kind reported to date, raising prospects for cost-effective carbon capture solutions. As global warming presents one of the biggest challenges to humanity in the 21st century, the quest to curb mounting CO2 emissions is more pressing than ever. In a study published in the Journal of the American Chemical Society, Osamu Ishitani and colleagues at Tokyo Institute of Technology (Tokyo Tech) and Japan's National Institute of Advanced Industrial Science and Technology report a photocatalytic system that brings scientists closer to achieving artificial photosynthesis—the goal of creating a sustainable system similar to the way that plants convert CO2 to useful energy by using earth-abundant metals. Although metal-complex photocatalytic systems have been reported for CO2 reduction, many of them used noble- and/or rare-metal complexes. Compared to these approaches that utilize rare metals (such as ruthenium and rhenium), the use of earth abundant metals is "greener" and inexpensive, and has thus attracted much interest. 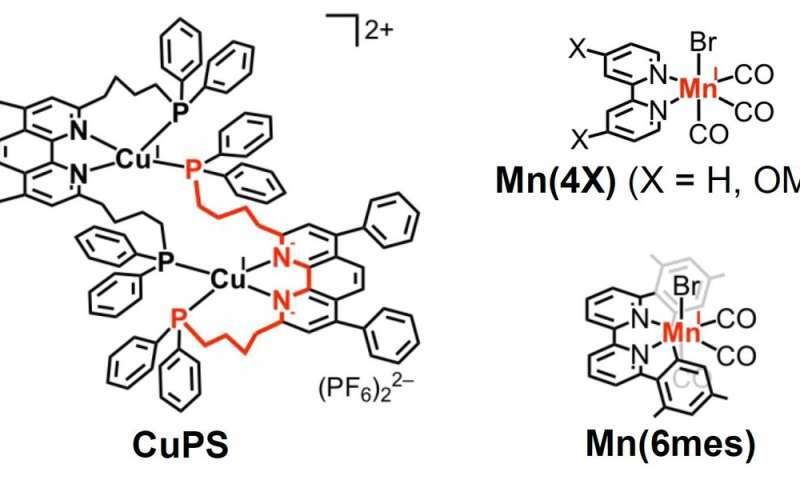 Their new process is made up of two components (see figure): (1) a copper complex (CuPS) that behaves as a redox photosensitizer and (2) a manganese-based catalyst, Mn(4OMe). CuPS proved to be a stable and efficient redox photosensitizer, as decomposition was only 2 percent after 12 hours of irradiation. In addition, CuPS exhibited a much stronger reduction capability compared to other photosensitizers investigated to date. The team reported that the total quantum yield of CO2 reduction products was 57 percent, the turnover number based on the manganese catalyst was over 1300 and the selectivity of CO2 reduction was 95 percent. In particular, the figure of 57 percent is remarkable, as the researchers comment: "To the best of our knowledge, this is the highest quantum yield for CO2 reduction using abundant elements and the yield would be comparable to that obtained with rare metals." The study highlights the way that incremental advances in chemistry may have a large impact on the wider goal of working towards a fossil-fuel-free future.